Future Q Technologies is a brand and providing quality online trainings to students in world wide. We are giving best online training on Hadoop Online Training. 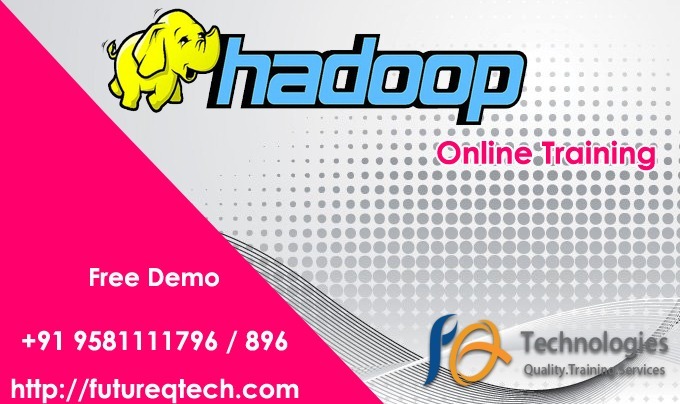 Future Q Technologies offers the most comprehensive and in-depth Big Data Hadoop training that is designed by industry professionals in order to help you with your career. This is one combo course that will give you complete mastery of Hadoop developer, administrator, analyst, and testing domains. Upon completion of the training you will be fully equipped to clear the Cloudera Certification exam. We are providing Hadoop Online Training in Hyderabad. We are one of best Institute to provide Best High Quality Hadoop online training all over India. If you are staying in Hyderabad, Bangalore, Chennai, Pune, Delhi, USA, UK, Australia, and Singapore etc. and unable to attend regular class room training programs then contact our training institute for information on online training. Big Data Hadoop Certification Training : It is a comprehensive Hadoop Big Data training course designed by industry experts considering current industry job requirements to provide in-depth learning on big data and Hadoop Modules. This is an industry recognized Big Data certification training course that is a combination of the training courses in Hadoop developer, Hadoop administrator, Hadoop testing, and analytics. This Cloudera Hadoop training will prepare you to clear big data certification. What you will learn in this Big Data Hadoop online training Course? Hadoop testing applications using MR Unit and other automation tools. Be equipped to clear Big Data Hadoop Certification. What are the prerequisites for taking this Hadoop Certification Training? There is no pre-requisite to take this Big data training and to master Hadoop. But basics of UNIX, SQL and java would be good. At Future Q Tech, we provide complimentary unix and Java course with our Big Data certification training to brush-up the required skills so that you are good on you Hadoop learning path.